I was doing some google search a while ago and I was totally struck by google.com's front page. Google.com (not even the Lebanese version google.com.lb that I don't use because it returns the search in Arabic even though I try to change it all the time) has the Lebanese flag on its main logo to celebrate Lebanese Independences day which falls today (November 22). I'm glad that at least google is giving this day some attention. Personally, I don't care that much since I don't believe that Lebanon is completely independent anyway. Ironically if you press on the link, you would see this leads to a search result for "Lebanon Independence Day". The third result for this search would be: PressTV - Iran hails Lebanon Independence Day. Could my point BE any more proven? 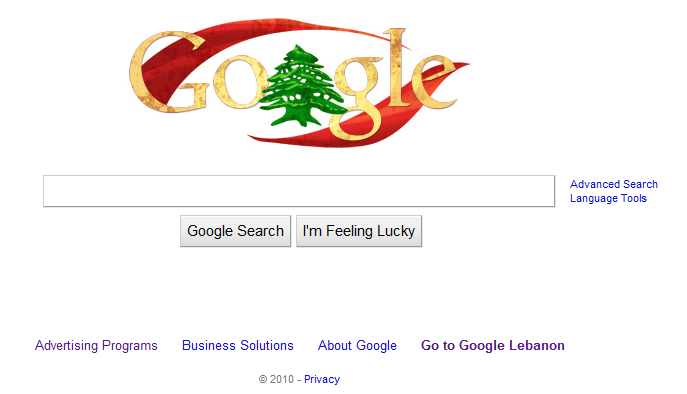 Outside of Lebanon, the Google main page is normal. I had to type google.com.lb to see what you guys see in Lebanon. No daisy apparently it applies to google international as well. How about we bring the French back? Would you people please stop with the we-are-not-independent cliche! God lebanese and their vanity!! LOL @ all the comments. Yes, I am aware that Google is aware of the IP addresses. I just wanted to point this out in case people in Lebanon thought that everyone who goes to Google.com doesn't think that it's this way all over the world. are you turning a blind I for KSA , SYRIA , USA , EU ,.... even Srilanka !!! !